The trend for minimalist logo design is cutting back clever illustrated symbols altogether in favour of clean, sans serif type and simple accompanying graphics. But a host of brands have built up a long-running association with a seemingly random symbol that rewards more digging. Have you ever wondered what the connection between a multinational food and drink company and a bird’s nest? It all comes down to the founder’s heritage. The first Swiss manufacturers to develop a logo for his business, Henri Nestlé had turned to his family coat of arms for inspiration. Nestlé means ‘nest’ in German, so perhaps unsurprisingly, his crest featured a bird on its nest. Given the company’s range of products included cereal for infants, Nestlé adapted the otherwise fairly random symbol back in 1868 to give it a nurturing twist, swapping the solitary bird for three baby birds being fed by their mother to create the ideal fusion between its name and its purpose. Over time, the logo was progressively simplified. And in 1988 the three baby birds were reduced to just two, in an attempt to represent the ‘average modern family’ – albeit in bird form. It may now be the world’s most permeating pizza chain, but Domino’s had humble beginnings as a small, independent restaurant called DomiNicks, after its owner Dominick DiVarti. It was then acquired by Tom Monaghan with his brother James in 1960, but had bought him out within a year in exchange for the old Volkswagen Beetle they used for their deliveries. By 1965, Monaghan had opened two more stores, but was unable to franchise the ‘DomiNicks’ name without DiVarti’s permission, and it wasn’t granted. An employee suggested changing it to ‘Domino’s’, and Monaghan instantly loved it: besides the phonetic similarity and visual branding potential, he was also excited about how his franchising ambitions could be represented in the logo. The three dots in the logo represent the three original Domino’s locations: the plan was to add a dot for every subsequent store that opened. It was a neat idea, except the chain was vastly more successful than he could ever have imagined – had Monaghan stuck to his guns, there would now be over 10,000 dots to fit on. Many brands draw on the history and heritage of the city or country they hail from, rather than the products they make. 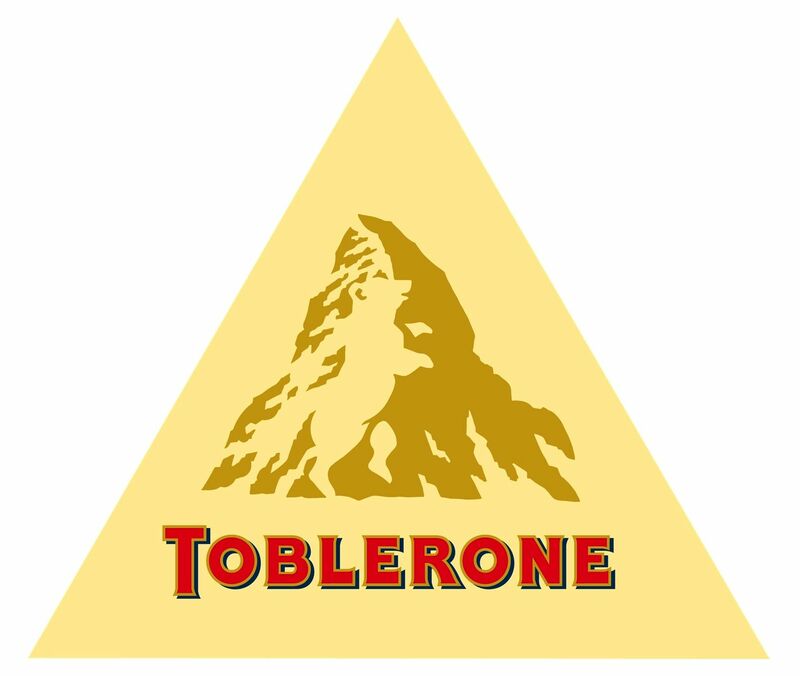 Toblerone is a great example: rather than depicting anything to do with the chocolate itself, the brand chose a geographical landmark – the nearby Matterhorn – as its emblem. That distinctive mountain shape is echoed in the triangular chunks of the chocolate bar itself, but the references don’t stop there. Hidden within the snowy patterns on the sheer face of the mountain is the outline of a bear – the official symbol of Bern, the Swiss city where Toblerone was founded in 1908. Where the symbol used by Nestlé are closely tied to a particular individual involved with the business – the founder’s name, where a particular exec studied – Toblerone’s symbol demonstrates pride in its origins, and gives a little-known regional emblem global significance.